Millions of teeth are saved each year using root canal therapy, so if youâ€™ve been told you need it â€“ youâ€™re not alone. At Murray Hill, we strive to do whatever we can to save and preserve your natural smile, including root canal therapy when itâ€™s the best option to save damaged teeth. Root canal therapy is also known as endodontic treatment, which means treatment of the inside of the tooth. Beneath each toothâ€™s hard surface and the hard layer of dentin lies the pulp. This soft tissue is where blood vessels and nerves are located. When the pulp inside a tooth becomes inflamed or infected, endodontic treatment, or root canal therapy is usually needed. Dr. Brown will remove the infected tissue, seal the space, and restore the toothâ€™s full function. Other symptoms to look out for that may indicate you need a root canal include pain, tenderness, discoloration, severe sensitivity to hot or cold food and drink, or swelling of surround tissue of the tooth in question. What can I Expect with a Root Canal Procedure? Many people are fearful of root canals based on the assumption that itâ€™s a painful procedure. In reality, with Murray Hillâ€™s modern techniques and anesthetic options, you could go through an entire root canal therapy procedure with minimal discomfort. 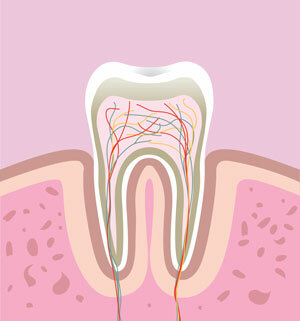 Following the root canal therapy, you may experience some sensitivity in the tooth that was treated. Overall, what used to be thought of as a painful and intense procedure is now pretty routine with little down time. Most importantly, a root canal can save your tooth and your smile! Contact us today to learn more about root canal therapy or to schedule your treatment.